Just to be contrary, you want to wear a kimono to the shrine on New Year’s Day instead of jeans and a nanopuff jacket, but puh-leeze, not one of those boring styles that make you look like a 1970s tourist souvenir! All stylin’ princesses know that kimono-hime is the way to go. First, ignore all those tedious seasonal references and go for a kimono emblazoned with…peonies! Pick an obi that has different patterns on each side, so when you tie it, they both show. And about that undercollar: lace, polka dots, anything but white. Add a couple of bows and be sure to wear a pillbox hat with a veil and some lace-up boots, and the kami-sama will be sure to grant you all your hearts’ desires! 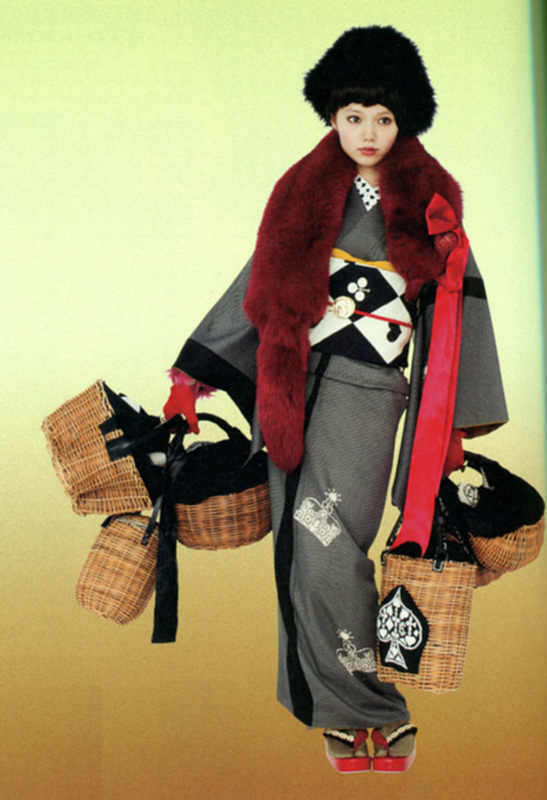 Here are a few more shrineworthy styles from the pages of Kimono Hime magazine! Gold lamé high-heeled booties and leopard fur hat: heads will turn. Crimson fox fur? Yes please! Thanks to Kimono Hime magazine (#10) for the gorgeous new style kimono photos! If you’d like to visit the Parco store in Shibuya the next time you’re in Tokyo, a map is on my website, The Tokyo Guide I Wish I’d Had. This is the princess-style kimono worn by part time English translator Yumi Hata in Nightshade. Jonelle, I’d say those out-of-season-for-New-Year’s flowers are peonies. And man, are *they* out of season! 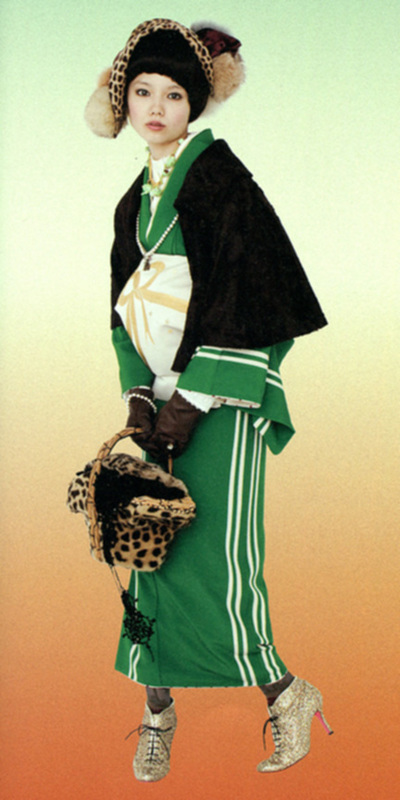 That green striped kimono is to die for. I’ve been looking out for the perfect striped kimono for my collection, and huge bonus if it’s green! 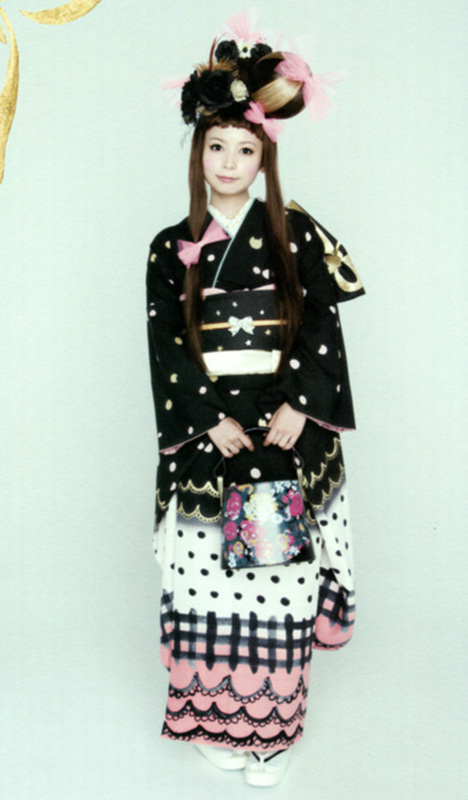 I do love the look of hime-style for kimono but I’m a little more of a traditionalist in my own kitsuke habits. Maybe someday I’ll try hime style. Now that you mention it, the only striped kimono I usually see are the ones with an overall narrow striped pattern that just reads as a sort of complicated color! Do you buy vintage kimono, or new ones? Oh it’s so cute! I love the colors. But whew….that’s one complicated-looking obijime knot! I’d totally wear mine like that if I could figure out how to tie it.